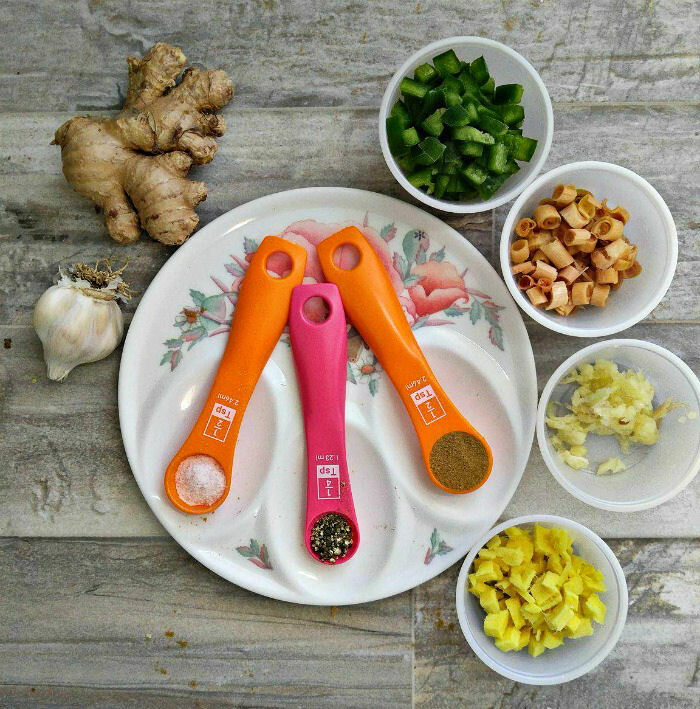 This delicious Thai Chicken Coconut Soup has a really well balanced combination of sweet, sour, spicy, and salty ingredients. The soup is Whole30 compliant, Paleo and Gluten Free. As an added bonus, the soup comes together in one pot to make clean up super easy later. 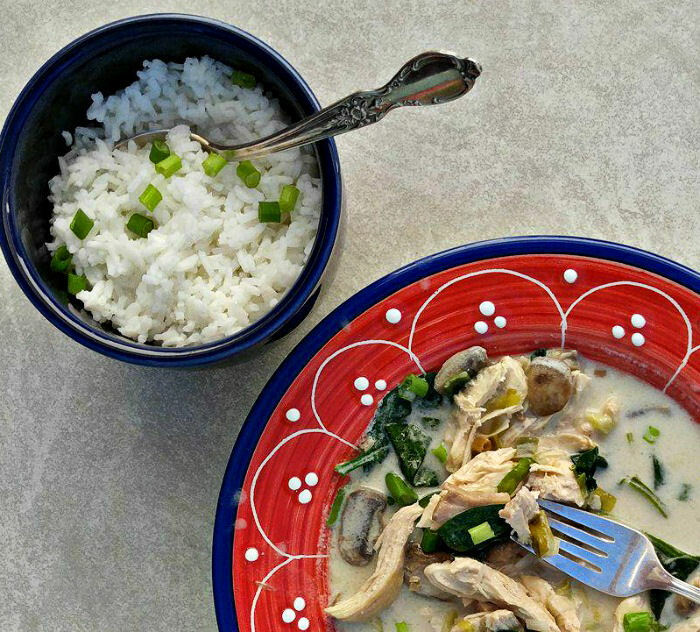 If you eat at Thai restaurants, you might have seen a similar version called tom kha kai. The taste is amazing and making one pot meals will develop so much flavor during the cooking process as each round of ingredients adds a new layer of flavor to the soup. If you are like me, January means a new commitment to a healthier lifestyle. For me, that means eating in a more healthy way and I always return to the Whole30 plan, since it focuses on good whole food which is filling and makes me feel great. Even though the diet is restrictive, I actually find it easy to stick to, since there are no gray areas. Just avoid process food, sugars and alcohol and eat healthy whole food.. The winter months are when I really enjoy the flavor of home made soup. It’s warming and hydrates the body which it needs when the heat is on all the time indoors. I also love soup recipes because most of them can be done in one pot which makes clean up later a breeze. For me, one pot meals are a very relaxing way to cook. Making this Whole30 Thai Coconut Chicken Soup. 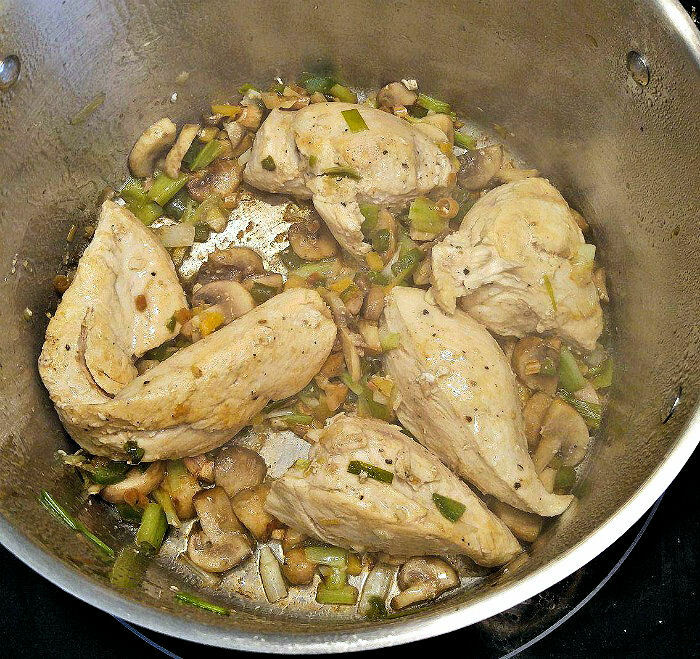 The mushrooms, chicken breasts, and spinach will get flavored with some lovely tastes as the recipe progresses!. 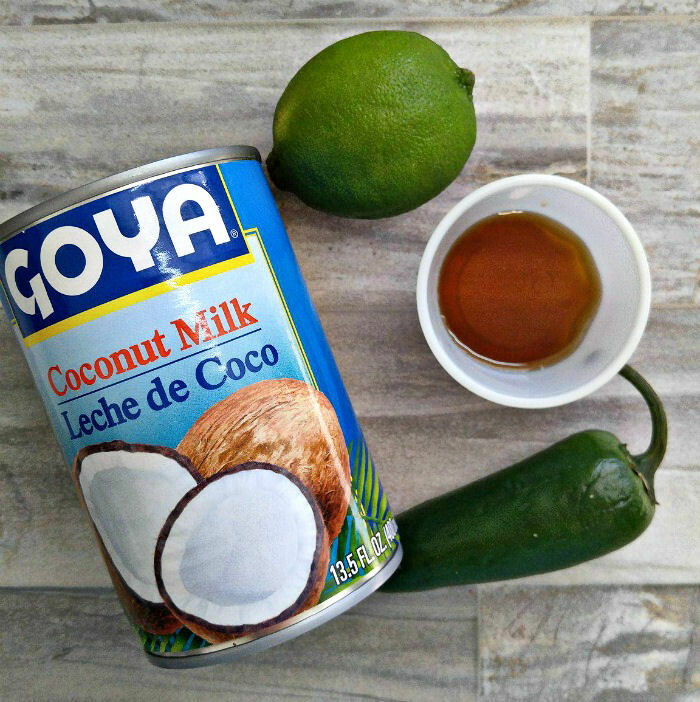 Start by melting the coconut oil in a dutch oven over medium low heat. 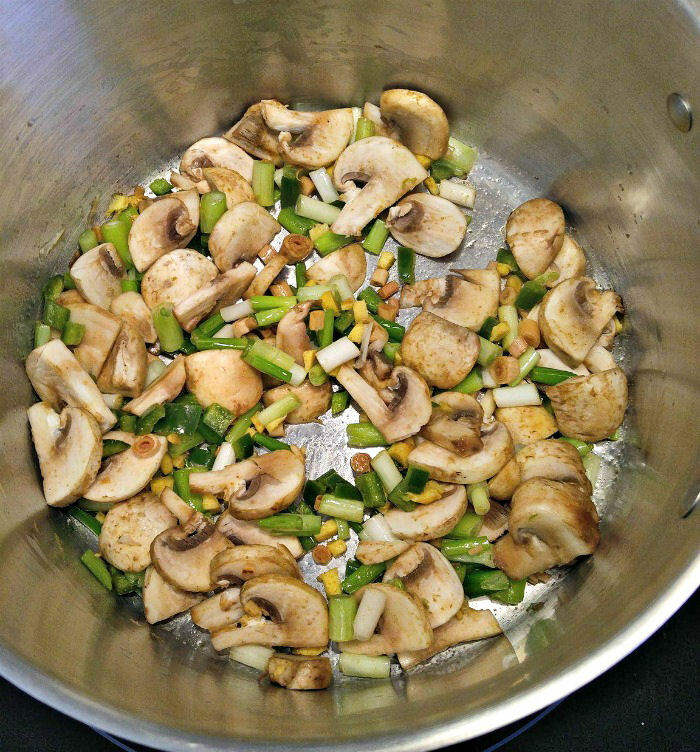 Add the green onions, garlic, mushrooms, ginger, cumin, lemongrass and jalapeno pepper. I like to use coconut oil because it has a high smoke point and won’t burn very easily. Raise the heat to medium and add the seasoned chicken pieces, cooking them until they are lightly browned on both sides. This gives a bit of a caramelized flavor to the soup that plain boiled chicken won’t do. Now it’s time to make the savory soup broth. Add the chicken stock, coconut milk, fish sauce, and lime juice. The soup will be smelling amazing now! Bring the mixture to a boil and then lower the heat and simmer for about 30 minutes till the chicken is cooked through. Take out the chicken pieces and shred them with 2 forks and then return the shredded chicken to the pot. Baby spinach goes in last until it’s wilted. It adds a lovely touch of green to the soup as well as extra nourishment and texture. Every bite of this amazing soup is just chock full of flavor. It’s hard to believe that sweet, salty, spicy and sour can be combined in one spoonful in such a tasty way. It has some heat from the red pepper flakes and jalapeno pepper but it’s not too spicy. The overall flavor is very savory. 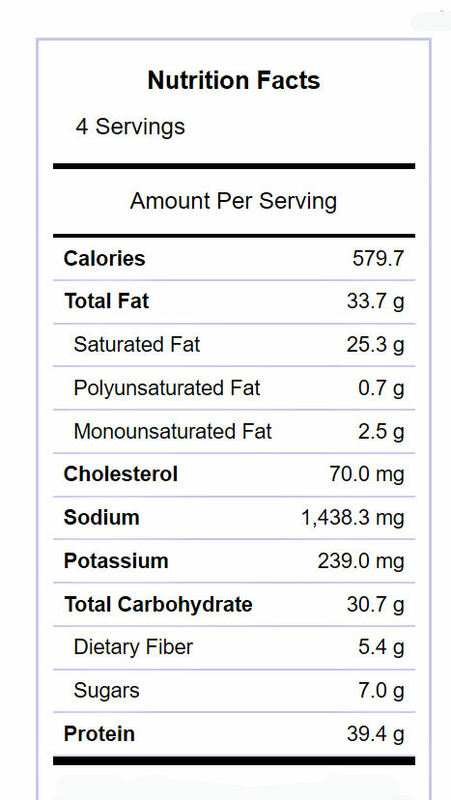 The recipe makes 4 hearty servings, each at 579 calories each. 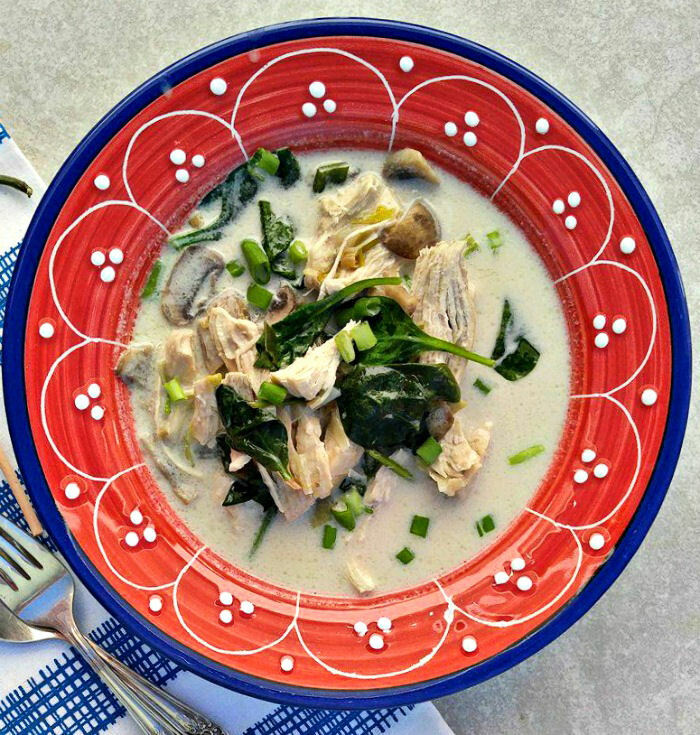 This Thai Chicken Coconut Soup is packed with flavor and nourishment. It’s made with real ingredients and is very quick to prepare. It’s the perfect way to make you warm in the cold winter months. If you would like it to be a bit more hearty, serve it with some boiled rice for a gluten free meal, or use cauliflower rice for Whole30 and the Paleo plan. Since the soup is made in one pot, clean up is a breeze. Why not make a big batch of it today? 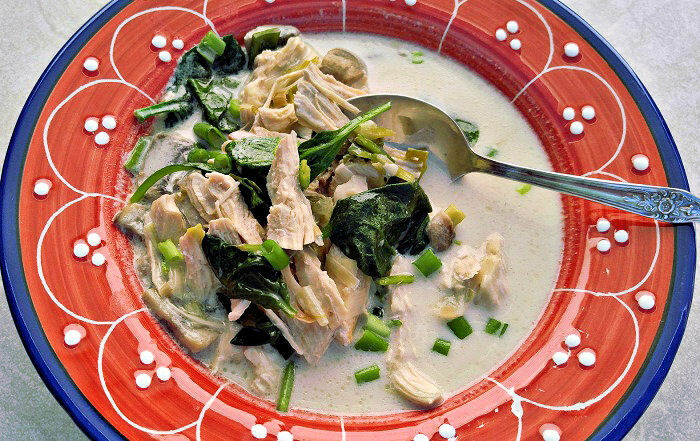 This delicious Thai Chicken Coconut Soup has a really well balanced combination of sweet, sour, spicy, and salty ingredients. The soup is Whole30 compliant, Paleo and Gluten Free. The soup comes together in one pot to make clean up super easy later. In a Dutch oven over medium low heat, cook the green onions, mushrooms, red pepper flakes, garlic, ginger, cumin, jalapeno, and lemongrass in the coconut oil. Stir often to make sure the garlic does not burn. Raise the heat to medium, season the chicken with salt and pepper and add the chicken pieces and cook until lightly browned. 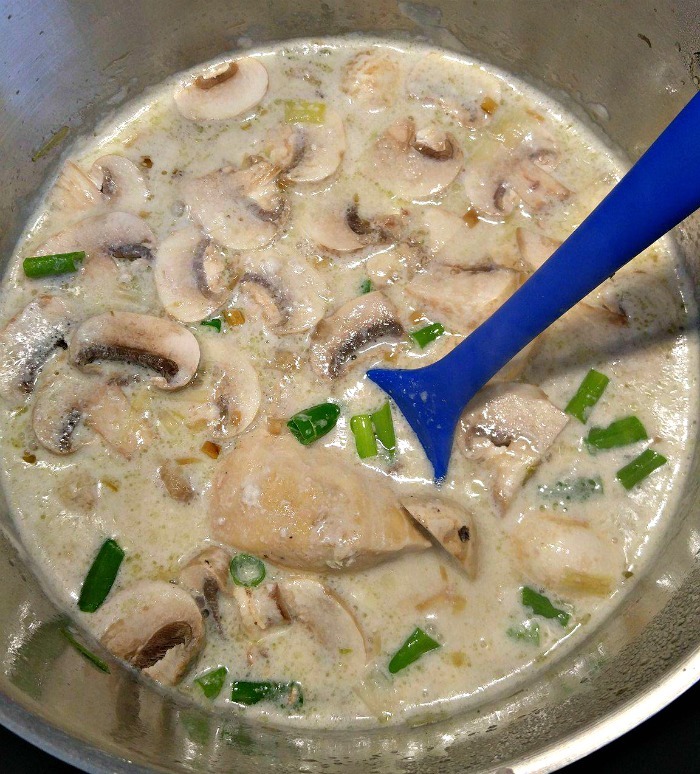 Stir in the chicken stock,coconut milk, fish sauce, lime juice and seasonings. Bring to a boil, then reduce the heat to medium low and cook, uncovered for 30 minutes until the chicken is cooked and no longer pink. 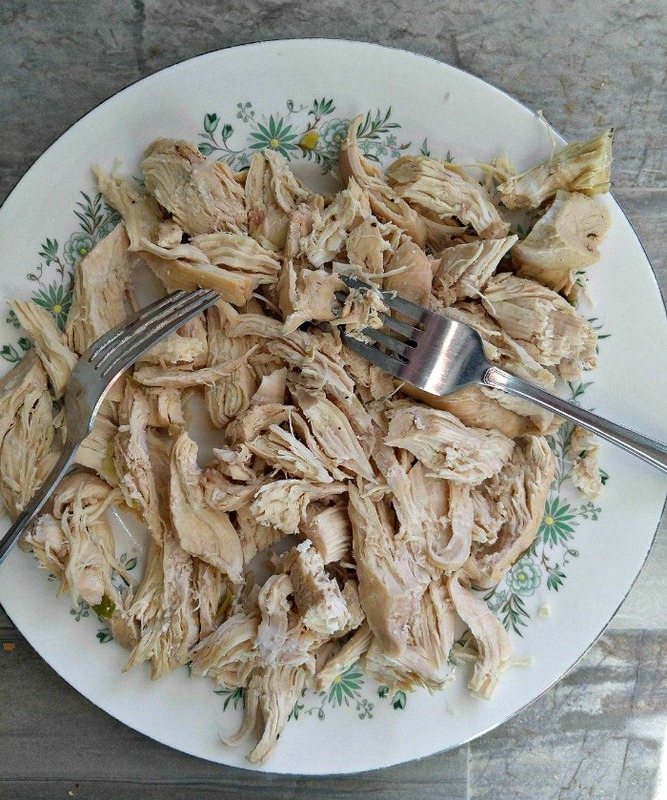 Remove the chicken pieces to a plate and use two forks to shred the chicken. Return the pieces to the Dutch oven. Mix in the baby spinach and cook until it wilts. Garnish with scallions and serve the soup garnished with lime wedges.